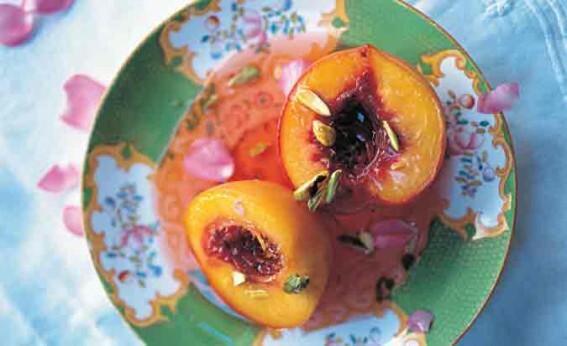 Peaches are beautiful with pistachios and roses, so this is a gorgeous-looking dish. If you have perfectly ripe peaches that aren’t too big, the peaches look good left whole, but halve and stone them if you prefer – it does make the cooking time quicker. Put the wine, caster sugar and lemon rind and juice into a saucepan big enough to hold the peaches as well. Bring gently to the boil, stirring from time to time to help the sugar dissolve. Leave the peaches whole and add them to the wine. Poach gently, turning them over every so often, until they are just tender. The length of time this takes depends on how ripe the peaches are. Remove the peaches and boil the poaching liquid until it is reduced and slightly syrupy. Leave to cool – the liquid will thicken more as it cools – then add the rosewater. Carefully remove the skin from the peaches (it should just slip off) and halve them. Pour the syrup over the cooked peaches and chill. Throw some chopped pistachios or shredded rose petals over the top and serve. Make as above but add a small bunch of basil leaves to the poaching liquid, then remove them once the syrup has cooled and use fresh leaves for serving. The basil flavour works well with red as well as white wine.